Retirement Center. Nursing Home. Memory Care. None of these three facilities are the same, yet they are terms constantly used to describe a multitude of places a person might reside in or spend time at during the later portion of their life. From independent living to assisted living and long term acute care, from a skilled nursing facility to memory care and outpatient care, the options available to seniors prove more helpful than ever, but the selection and placement process can be daunting. As designers and architects, our knowledge of potential challenges and needs influence the design and amenities carefully strategized for a space’s purpose. Through our experiences, both personal and professional, we have come to realize optimal characteristics of care environments. In this blog post, we’ve curated a list of essential interest points specific, but not limited to, one such environment: a skilled nursing facility. A skilled nursing facility is similar to a nursing home but offers a higher level of trained professionals, or medical expertise, and services to aide injured, sick, or disabled individuals through their rehabilitation period or extended, full-time care for a worsening disease. 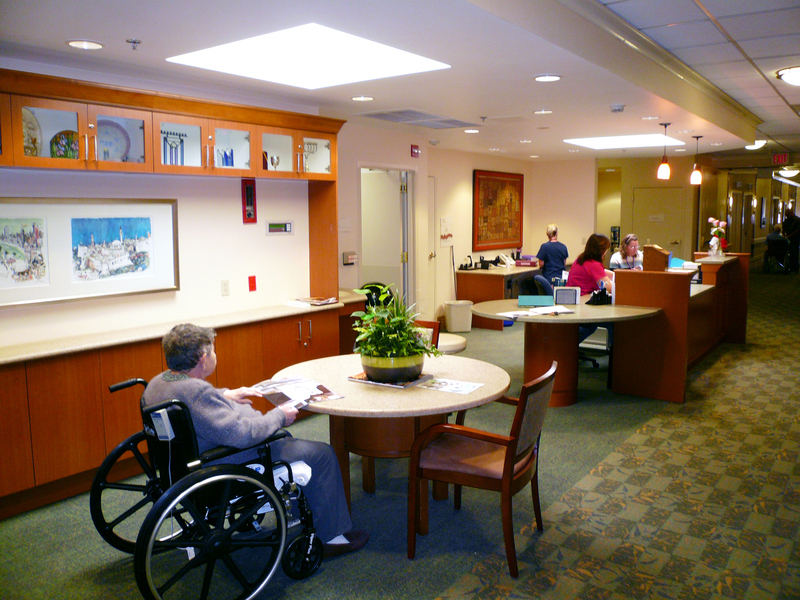 An example of a skilled nursing facility is the Seacrest Village Goldberg Healthcare Center in Encinitas, California. Accessibility: Seniors can be easily disoriented. The senior’s travel path should be simple and short, with places to sit or lean to rest along the way. Scenery: Views to the outdoors should be available, to help provide directional orientation, and to provide the comfort and distraction of watching the movement of trees and birds. Light: Light should be ample but glare-free, since seniors have a harder time focusing with glare. As new settings can cause anxiety for those with diminished sight, hearing or memory, attention should be paid to acoustics, colors, contrast and patterns and visual cues that reinforce memory and provide signals of where it is safe to go, and where it is not. No-Hassle Technology: Simplicity in required processes and movements is key, especially as our technologies become more complex and dependent on non-arthritic fingers. This requires attention to small details like thermostats, window latches and call buttons. Familiar Routines and Details: Activities and schedules designed for diminishing mental skills are comforting, as change is not in their benefit and consistency is. Details like a memory box – where a resident can store photos, personal items and cherished mementos – are nice touches to have in or just outside one’s own room. In an article that appeared in the San Diego Union-Tribune on April 2, 2015, La Jolla resident Shari Mount-Essex described her experience with early-onset Alzheimer’s. “Here I am in middle age, the prime of my life at age 52, anticipating all the wonderful things that this world has to offer…oblivious that an insidious entity was high-jacking my memory,” she began. Actor Julianne Moore’s recent portrayal of a middle age woman facing early-onset Alzheimer’s in Still Alice rang so true and was executed so well it won her an Oscar. Early-onset diseases can and do happen, and knowledge of local resources is imperative in choosing care. A few, perhaps difficult but meaningful, conversations while you and your loved ones are healthy can relieve stress during the decision-making process when action is necessary. As with most cyclical experiences in life, these choices are typically only broached or understood on a deeper level when you, or someone close to you, arrives at it. His strong personal ties to care facilities propel him to design capable, advantageous environments, exuding comfort and care. The questions he asked himself in regard to his mother’s circumstances, combined with our aesthetic tips to look for, will help guide your selection process. 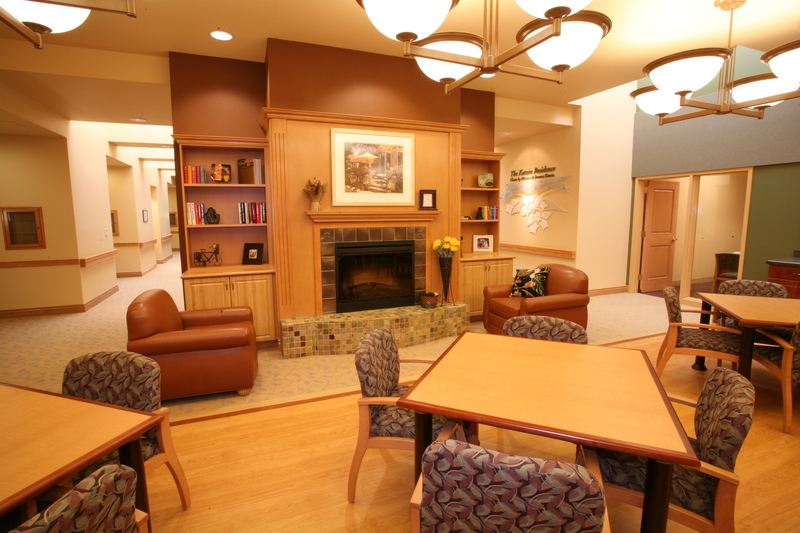 Take a peek at SGPA’s Senior Nursing Facility and other Wellness projects here. The Nurse Station at Seacrest Village’s Goldberg Healthcare Center. SGPA led a complete redesign incorporating a seating area for residents less institutional in design, including new finishes, casework and lighting. The Tub/Shower Rooms at Seacrest Village’s Goldberg Healthcare Center. SGPA led a total redesign of two tub/shower rooms from an institutional model to a resort spa model. The redesign includes new finishes and fixtures, lighted mirrors, clothing lockers and towel warmers. 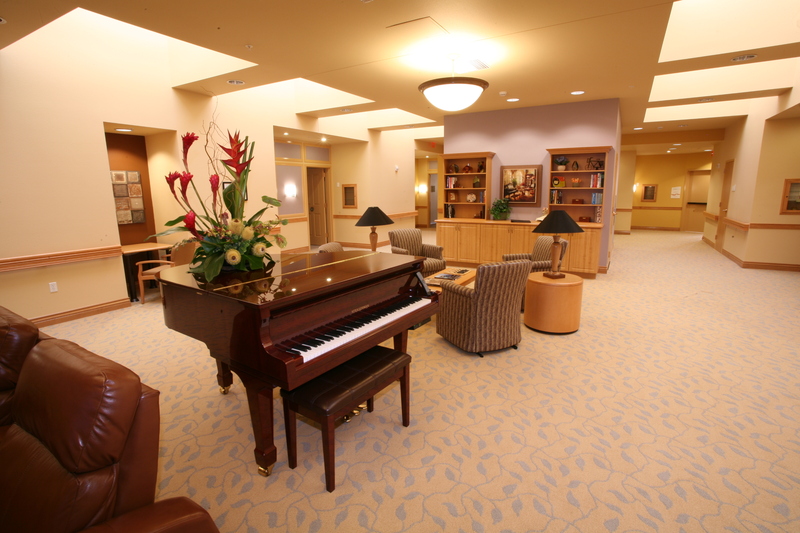 The lounge at Seacrest Village’s Katzin Residence encourages residents to interact with one another. Music can play a large part in aiding memory exercises. The common-area kitchen at the Katzin Residence evokes a kitchen reminiscent of a home, with friendly and familiar designs. I do appreciate it when you said that the traveling path of the senior should be simple and easy to understand as they are very sensitive and can get confused rather easily. That is true, and that is the reason why I have decided to keep that in mind for when I look for a nursing home for my grandma. Dealing with a new place is already difficult, I want to at least, make traveling easier for her. Thank you for the tips. I appreciate your tip on looking into the scenery when looking for a nursing facility for your loved one. It seems that if you are going to change where someone is staying it would be a good idea to find somewhere that has a nice view. We’re looking for a health care facility for my father in law so we should probably look for one with nice scenery. Congratulations To Our New Principals! © 2019 SGPA Architecture and Planning.